For me photography is still about those lucky moments where you're in the right place at the right time. However, it's also to a large extent about noticing those moments that most people don't. I'm still shaking from the excitement yesterday of being at the scene of something truly spectacular, and incredibly of being the only person with their jaw dropping at the incredible thing in front of my eyes. Anyway, words don't do it justice! This is a 22 degree solar halo in perhaps the top place in the world I would have hoped to see one! Go to Atmospherics Optics for a great explanation of this phenomenon. Also see here for more of my photos of this. Don't have a clue how you held the camera still enough! FANTAAAAAASTIC SHOT!!! I LOVE THIS PICTURE, awesome and how on earth did you do this?? love everything here!!! Hi all, many thanks. 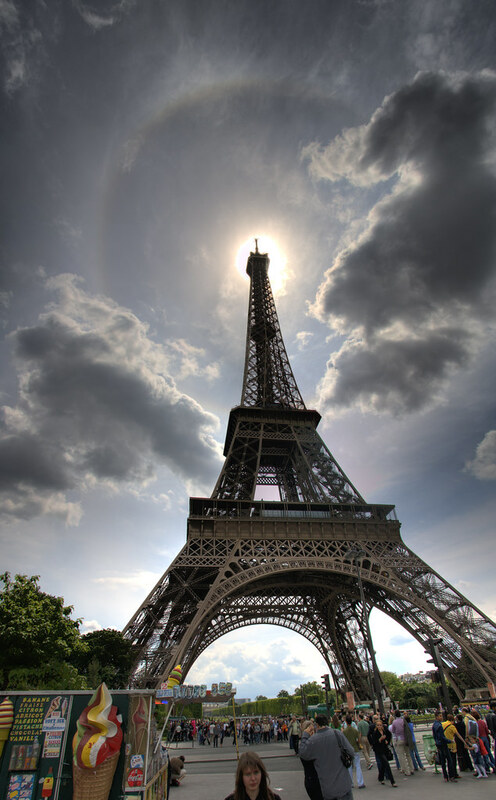 To M.Kate, it was more luck than judgement, though I had seen a tiny part of a solar halo earlier in the day and pondered how amazing it would be to see one at the Eiffel tower!